Obama Taking His Economic Message To Twitter Town Hall : It's All Politics When you're a U.S. president, you can never have too many followers. So it makes sense, then, that President Obama would eventually turn to that ultimate population of followers, the 140-character delimited Twitterverse by holding the first White House Twitter town hall Wednesday.At the event scheduled to start at 2 pm eastern time and "presented" by Twitter, people will be able to tweet their questions to the hashtag #AskObama. When you're a U.S. president, you can never have too many followers. 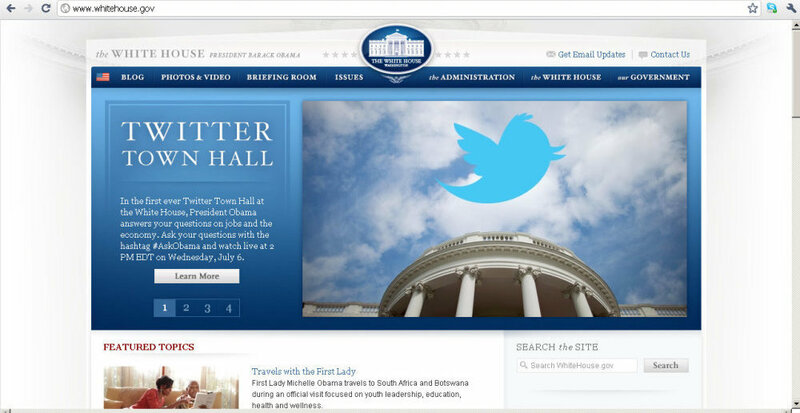 So it makes sense, then, that President Obama would eventually turn to that ultimate population of followers, the 140-character delimited Twitterverse by holding the first White House Twitter town hall Wednesday. At the event scheduled to start at 2 pm eastern time and "presented" by Twitter, people will be able to tweet their questions to the hashtag #AskObama. For his part, the president won't be limited to 140-character answers. His responses as well as the entire East Room event will be available via webcast. White House officials have extolled the forum as a way for citizens to have interactive communication with the president, much like when Facebook and Google hosted similar forums. The purpose of doing this event is to try to find new opportunities to connect with Americans around the country. And so whether we're inviting them here to the White House through this tweet-up, or whether we're using a social media platform like Twitter to get out of D.C., we're really excited to bring in new voices to the conversation with the president, and are particularly excited about the format of tomorrow's event, which I think will take advantage of the real-time nature of Twitter to actually have a conversation and a set of questions that evolves as the president's speaking and as people are watching live. The White House has 2.25 million followers. (Twitaholic gives some context. Lady Gaga has 11.4 million, Justin Bieber 10.8 million and the Obama 2012 campaign almost 9 million.) Wednesday should help it add to that number. The focus of Wednesday's event, moderated by Twitter'S 34-year old co-founder and executive chairman Jack Dorsey was to be jobs and the economy. Twitter's running filters to keep anything too unseemly from getting through, according to White House officials. This is the Internet after all. Twitter would also be selecting the questions for the president. Speaking of filters, the event is another chance for the president to bypass the mainstream media to speak directly to voters. And the use of social media gives the event a kind of conversational gloss between the president and the people. • We've partnered with Mass Relevance to curate, visualize and integrate conversations for the event. • A team of seasoned Twitter users with experience discussing the economy will help flag questions from their communities through retweets. Meanwhile, some of the president's political rivals are showing that they can play this Twitter game, too. It will be interesting to see how many of these less-than-frlendly questions get put to the president by Twitter's Dorsey.